The Blossoms began their career in 1954, in Los Angeles, California, while still in high school. Originally, the group was a sextet of young girls singing for fun. Calling themselves The Dreamers, the group restricted their repertoire to spirituals, because two of the members had parents who were against their daughters singing the secular rhythm & blues music popular on the radio during the early 1950s. Fanita Barrett, Gloria Jones, Jewel Cobbs, Pat Howard and twin sisters Annette and Nanette Williams all came from musical backgrounds. The twins had taken vocal and dancing lessons as youngsters. Fanita's brother Ronald was already a success with his vocal group, The Meadowlarks, who scored a local hit with Heaven And Paradise. The Dreamers were introduced to local musicians through Dexter Tisby, then successful with his own group, The Penguins, who hit the big time with Earth Angel. One young man who took special notice of the group's talent was Richard Berry. Berry, just out of high school himself, was fast becoming a popular crooner. He felt that The Dreamers complemented his mellow, baritone voice. Another personality who noticed the talent of The Dreamers was bandleader/disc jockey Johnny Otis. Otis invited the girls to join him on his radio shows on KFOX. Once Pat and Jewel's parents got wind of their daughters' extracurricular activities, they protested, prompting the two young ladies to leave The Dreamers. The group was now officially a quartet. The Blossoms, 1957 (clockwise from top left) Fanita Barrett, Gloria Jones, Annette Williams, Nanette Williams. The Dreamers joined Richard Berry in the studio after much rehearsal. During 1955 and 1956, the unit made several recordings for Flair and RPM Records. Among them was a version of Harry Warren and Mac Gordon's At Last and several of Richard Berry's compositions, Together, Wait For Me, and Daddy, Daddy. 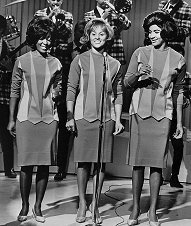 The Dreamers gained notoriety as versatile singers and began getting studio work singing backup for other artists, as well as recording a few singles of their own, as The Dreamers and The Rollettes, although only Fanita, Gloria and Annette were involved in The Rollettes projects. The Rollettes 1957, left-right: Fanita, Annette, Gloria. The Dreamers eventually worked with vocal coach Eddie Beale. Beale enhanced their harmonies, teaching them more intricate, close harmonies. Confident that the group had major label potential, Beale brought The Dreamers to Capitol Records. One of the executives, noticing their different skin tones, said they looked like a bouquet, hence they were re-christened as The Blossoms. Even though signing to Capitol was considered a step up, the group's stay at Capitol was short, yielding only three singles--none of which made any chart impact. The Blossoms also underwent a significant change at this time. By 1958, Nanette was married, pregnant, and planning a leave of absence from the group. A 17-year-old girl with a unique and powerful voice was asked to be her replacement. Darlene Wright not only replaced Nanette, she was selected to be the lead--something the ensemble-based Blossoms had not previously considered. 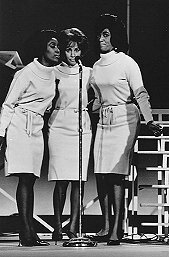 The addition of Wright would change the style of the group, but despite Darlene's unique presence as lead on songs like No Other Love for Capitol in 1958, Sugarbeat for RCA (as The Playgirls) in 1960 and Write Me A Letter for Challenge in 1961, chart success was still elusive. During the summer of 1962, The Blossoms would finally emerge successful on the charts, but, unfortunately, under an "alias." Then-unknown producer Phil Spector used them on a song he had acquired from singer/songwriter Gene Pitney. Spector was having success on the East Coast with a quintet of young Brooklyn girls named The Crystals, who already had two major hits with Spector. Problems between The Crystals and Spector prompted him to record this new song without them. Instead he used The Blossoms, who received a meager session fee. The song, "He's a Rebel," turned out to be a monster hit, firmly establishing Spector as a force to be reckoned with in the music industry. The single with The Blossoms' voices was billed as The Crystals, much to the dismay of the real Crystals. Over the next three years, The Blossoms, with Darlene as lead, would be the favored singers on all of Spector's sessions recorded in California. They were The Crystals once again on He's Sure The Boy I Love. Darlene and Fanita sang with Bobby Sheen as Bob B. Soxx and The Blue Jeans. This combo spawned recorded hit singles for Spector, including the grinding version of the Disney classic, Zip A Dee Do Dah. The Blossoms more than likely recorded all the backgrounds on numerous sessions by The Crystals, The Ronettes and Darlene's solo efforts under the new stage name Phil had given her--Darlene Love. However, this association would prevent the group from establishing themselves as primary artists. At a crucial time in the industry, when new sounds were striking the listening public at full speed, The Blossoms seemed to be floundering as recording artists. It was quite a different story, though, when it came to their stature as session vocalists. 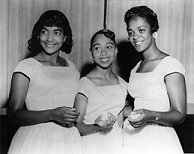 In 1964, the trio, now Darlene, Fanita, and newcomer Jean King, were a featured part of a relatively successful weekly Rock & Roll television program called Shindig. The Blossoms used their vocal versatility to their advantage, singing in various styles behind a variety of artists--from Patty Duke to Shelley Fabares to Marvin Gaye. They also had their own spots, covering popular songs of the day. This ability would see them through the 60s, amid numerous production and record label changes. Gloria Jones recorded intermittently between going to school and venturing into other careers. Darlene eventually left The Blossoms in 1974 in controversy over business decisions and Jean's alleged drug abuse. Jean King died of a heart attack in Las Vegas in 1983. Fanita kept The Blossoms going, with varying personnel, on the Vegas circuit until 1990. Darlene stayed out of the music business for about five years after a brief and unpleasant reunion with Phil Spector in late 1974. She made a comeback in 1981 and two years later, was starring in Leader of the Pack, the Broadway musical based on the life of songwriter Ellie Greenwich. Darlene added to her rising impact with a new acting career, portraying Trish in the Lethal Weapon movie series. She also had her own highly successful one-woman show, "Darlene Love: Portrait of a Woman" at The Bottom Line in New York City. She is currently working in the Lou Rawls production of Me and Mrs. Jones. The Blossoms were the icons of vocal versatility and made their mark in the music industry by working behind the scenes, never once sounding like they were tired of standing in the shadows. Hey, that's where all the fun was!